418 pages | 6 Color Illus. | 50 B/W Illus. Sugar consumption is suspected to play an important role in the pathogenesis of diabetes, cardiovascular disorders, fatty liver disease, and some forms of cancers. Dietary sugars—fructose in particular—also have a potential role in obesity and metabolic diseases. Dietary Sugars and Health presents all aspects of dietary sugars as they relate to health and disease. It provides a review of the current science related to dietary sugars, ranging from historical and cultural perspectives to food science and production to basic research, animal trials, human pathophysiology, epidemiology, and public health policy implications. Each chapter features a concise, thorough summary of the current knowledge, including an overview of cutting-edge research, controversies, and future perspectives. The book provides a balanced approach through global and multidisciplinary contributions as well as input from various sectors, from academia to the food and beverage industry. The overall collection provides readers with a balanced and complete view of the science related to dietary sugars and health. This book is an invaluable reference for food scientists, nutrition scientists, clinical and translational researchers, obesity researchers, physiologists, public health scientists, and policy makers. 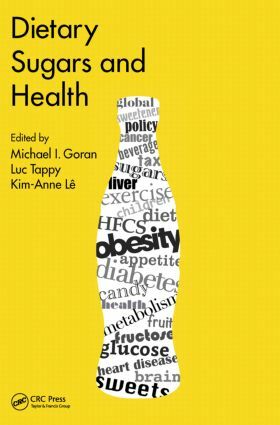 "The areas covered are wide-ranging and ensure that the book is no dry debate but a fascinating tour of all aspects of dietary sugars and health." Michael I. Goran is a professor of preventive medicine and pediatrics at the University of Southern California in Los Angeles. He is also the founding director of the USC Childhood Obesity Research Center and holds the Dr. Robert C and Veronica Atkins Endowed Chair in Childhood Obesity and Diabetes. In addition, he serves as co-director of the USC Diabetes and Obesity Research Institute. He received his PhD from the University of Manchester in the UK. His work focuses on understanding the metabolic and nutritional factors linking obesity to increased disease risk during growth and development and using this information as a basis for developing interventions for prevention and risk reduction. He has published more than 300 peer-reviewed scientific articles and reviews and is the co-editor of the Handbook of Pediatric Obesity. Luc Tappy is a professor of physiology at the University of Lausanne in Switzerland and an associate physician in endocrinology, diabetes, and metabolism at Lausanne University Hospital. He has extensively studied the metabolic fate of fructose in healthy humans and in patients with metabolic disorders with the use of tracer methods. As a physician, he has been mainly involved in the dietary management and surgical treatment of obese patients. His research has been mainly supported by grants from the Swiss National Science Foundation and other funders. Kim-Anne Lê is a research scientist at the Nestlé Research Center in Vers-chez-les Blanc, Switzerland. She obtained her PhD from the University of Lausanne and completed a postdoctoral fellowship at the Childhood Obesity Research Center in USC Los Angeles. For the past ten years she has been studying the effects of sugars and fructose on cardiometabolic risk markers. She has received research support from the Swiss National Foundation for Science for these activities.